Lucy Kirkwood has life-and-death issues on her mind in her clever, thought-provoking drama The Children, but she is wily enough to wrap her themes inside a very human character study. 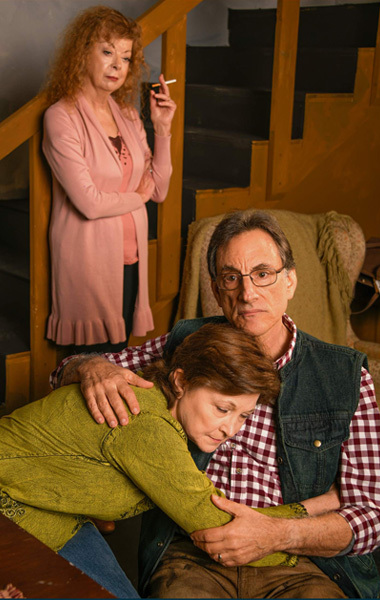 And at GableStage, which is giving the work its area premiere, director Michael Leeds brings this somber little play to life with Laura Turnbull, Angie Radosh and David Kwiat – three of the area’s finest actors and veterans of this Coral Gables playhouse. Though a mere 90 minutes long, Kirkwood’s play seems out to test the audience’s patience, opening with a scene of idle chat between two women, former work colleagues reuniting after 38 years apart. Kirkwood lights a slow-burning fuse, but never doubt that we are in for a seismic explosion. In a small, but cozy cottage on the rural east coast of England, Hazel (Turnbull) lives in retirement with her husband Robin (Kwiat). Like most local residents, their lives revolve around adapting to “the disaster,” a reference we gradually learn that refers to a weather-related meltdown of a nearby nuclear power plant. Daily life has been inexorably altered for those in proximity to the contaminated zone. The tap water is undrinkable, the electricity is intermittent, radiation is monitored regularly by Geiger counter. No one understands this more than Hazel and Robin, two former nuclear physicists who helped design, build and, later, operate the now-toxic plant. At the outset of The Children, Hazel is startled by the arrival of Rose (Radosh), also a former nuclear plant worker, gone from the area for decades, but hardly forgotten. The two women catch each other up on their lives and, in Hazel’s case, on her children and grandchildren. Rose had neither, in fact never married, perhaps because of a longtime affair with Robin, which Hazel may or may not know about. Still, there is a sense of mystery in the air, as Rose’s purpose for the sudden visit remains unclear. Eventually, Robin returns home and we learn a bit more about Rose’s motive and the uneasy three-way relationship as Kirkwood contrives to have them each leave the cottage’s living room, one by one, out of earshot of the others. It would not be giving too much away to add that The Children has been described as an “eco-thriller,” and the play hinges on the characters’ perceived obligation to clean up the mess their earlier professional efforts made and what these three – heading into their twilight years – owe to future generations. That could all have been dry debate, but at GableStage it is anything but, thanks to Kirkwood’s writing skill and the three performers. There is a subtlety to Turnbull’s acting turn here, a seeming ordinary woman, set in her ways, unnerved by Rose’s unexpected appearance and even more so by her unusual proposition. Radosh’s Rose has been riddled with cancer, which has taken its toll on her body and perhaps on her outlook on life. She knows how disruptive she is being to Hazel’s orderly world which gives her the upper hand in their exchange. Subtle is not a word that describes Kwiat’s approach to Robin, who comes off as quirky in a way that links him to so many of the actor’s performances over the years. Still, there is an underlying reality he also projects, which allows him to mesh well in this three-way ensemble. GableStage artistic director Joseph Adler usually takes the lion’s share of the staging assignments at his theater, but he has understandable faith in the skills of Leeds (who demonstrated them in last season’s Carbonell nominee White Guy on the Bus.) Here he shows how to muster tension and suspense with simple, unhistrionic strokes in a play that builds slowly and eventually grabs us by the throat. THE CHILDREN, GableStage, 1200 Anastasia Ave., Coral Gables. Through Sunday, April 14. $60-$65. 305-445-1119.